The address of the tea dealers caused some confusion, because of the unusual circumstance that the corner shop has two addresses, both with house number 21, that is: 21 Charlotte Street and 21 Goodge Street. Not to mention the fact that the house next door to 21 Charlotte Street is another 21 Charlotte Street, occupied by surgeon Gibbs. We will talk about him in a later post, but here we are concerned with the tea dealers. 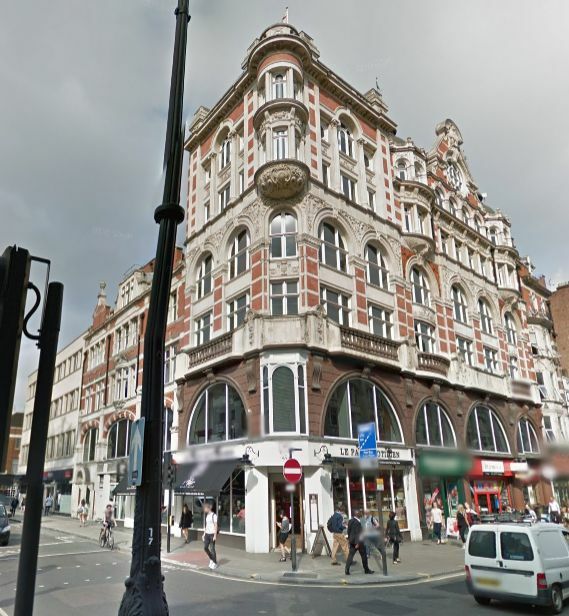 The elevation above this post shows the Goodge Street front and the one on the left the Charlotte Street front. 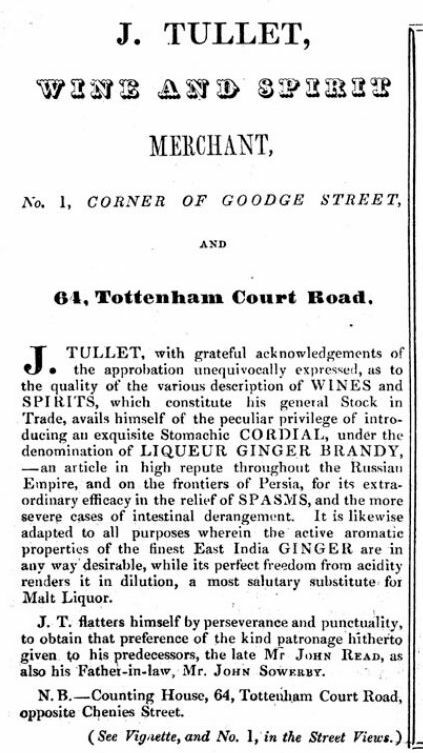 Tallis has How and Cheverton as tea dealer in the Goodge Street index and as tea warehouse in the Charlotte Street index, but as you can see from the picture, they were also dealing in wine. Both sides of the building are 4 windows wide and a look at Google Street View shows that this is still the case; the house numbering has, however, changed and is now 44 Goodge Street and 44 Charlotte Street. So, who were these tea (and wine) dealers? Thomas Cheverton can be found at 21 Goodge Street in the 1841 census as ‘grocer’, but Thomas How is living at Turnham Green. With him are living a number of his children, but also a Louisa Cheverton and the one-year old John How Cheverton. Louisa Sarah, as she was officially baptised, was a daughter of Thomas How who had married John Orrill (or Orrall) Cheverton in 1838. We can assume a family link between this John Orrill and the Thomas who was in partnership with How, although I do not know which one exactly. The Chevertons and the Hows both had links to the Isle of Wight. Places of birth were not recorded in the 1841 census, but they were in the 1851 census and both Thomas How and Thomas Cheverton list the island as their birth place. But there was another link. Thomas Cheverton’s wife was one Mary Way, also from the Isle of Wight, and Thomas How dissolved a partnership in 1835 with one James Way, also from the Isle of Wight. James and Mary Way were most likely brother and sisters, the children of Henry Way, who died in 1839 on – you guessed – the Isle of Wight. 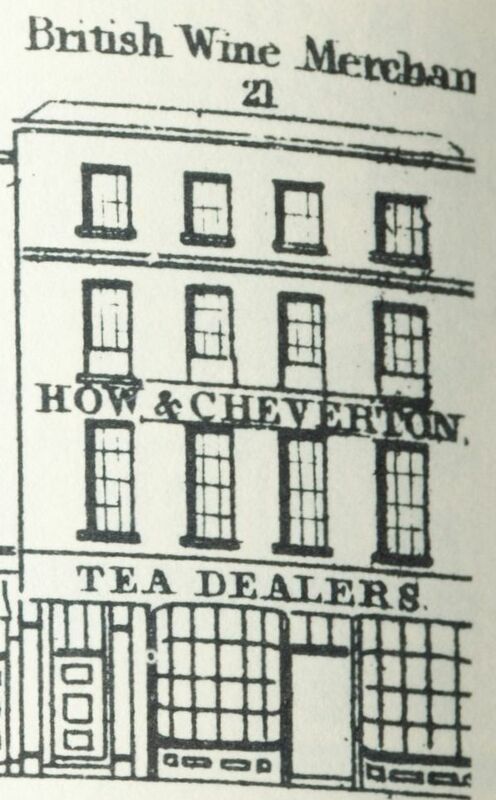 One William Way and Thomas How had been trading as tea dealers and grocers at Great Newport Street until 1814 when they dissolved their partnership and James Way and Thomas How had been trading at 272 and 282 Oxford Street. (1) Tallis lists ‘Way & Co’ at number 272 and ‘How & Co’ at number 282. More on those businesses in another post, but first more on the grocery business in Goodge Street. Thomas How, on the other hand, did quite well. 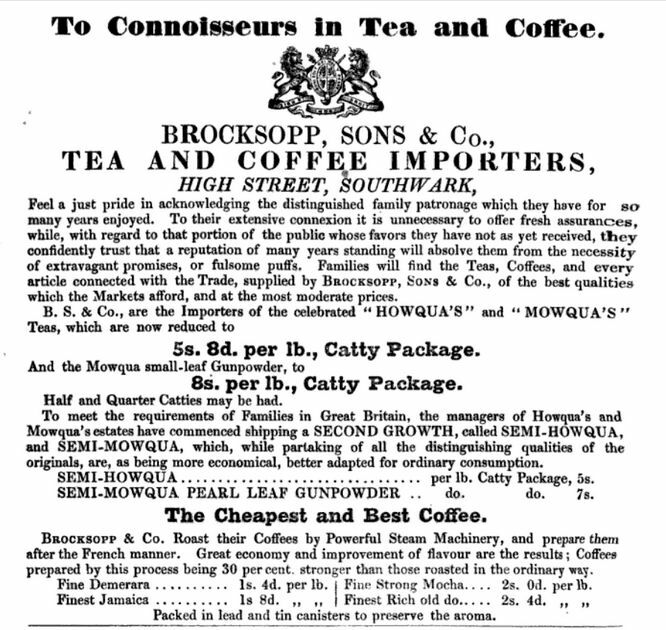 At some point he entered into a partnership with the Brocksopps, grocers and tea dealers at 233 and 234 Borough High Street. Pigot’s Directory of 1839 lists William Brocksopp & Co. at 233 Borough High Street, but in 1842 they are declared bankrupt. Thomas How probably came to the rescue as the 1843 Post Office Directory lists the firm as Brocksopp, How & Co. At various times, “Thomas How, of 233 and 234 High Street, Southwark, tea dealer”, was named as one of the trustees in bankruptcy cases, as for instance in 1844 when he was to be one of the trustees of the estate and effects of William Sloan of Banbury. (4) And again in 1847 for the estate and effects of John Bumpstead of 297 High Street, Chatham. (5) The partnership with the Brocksopps probably ended in late 1850 as the advertisement above no longer shows his name, although the 1851 Post Office Directory still has Brocksopp, How & Co. for the Borough premises. Although I have not found an official notice of the end of partnership in The London Gazette, How’s name no longer appeared in the entry for the Brocksopps in the 1856 Post Office Directory. Grandson John How Cheverton also went into tea and could be found in Hong Kong in 1865 for Johnson & Co. of Gough Street. (6) In 1866, he was to become a partner in that firm. (7) But he was not the only one of the family to go to China, as the address given for his uncle Edwin Henry How in the probate record of Thomas How was Foo Chow, China. (8) Thomas had died in March 1866 at Gordon House, Turnham Green, where the censuses since 1841 had found him. Before that, or at least between 1814 and 1835, when his numerous children were baptised, his address had always been Great Newport Street. And what about 21 Goodge/Charlotte Street? As we saw, Thomas Cheverton moved out before 1847 and twenty years later, the property came on the market and was described as “a dwelling house, with double-fronted shop and premises […] an important situation, in the occupation of Mr. Anderson, chemist, on lease at £140 per annum”. 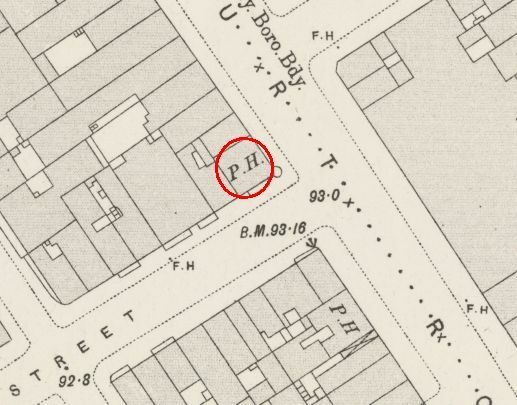 (9) In the twenty years between Cheverton’s move to John Street and Anderson’s occupation at the time of the sale, various occupants can be found for the premises. The 1851 Post Office Directory lists John Bainbridge, upholsterer, for 21 Goodge Street, but he made way in the 1856 Post Office Directory for Mrs Mary Ann Bott, who ran a straw bonnet manufactory. She can already be found there in the 1851 census, while John Bainbridge is not to be found in the census of either 21 Charlotte Street, nor in 21 Goodge Street. 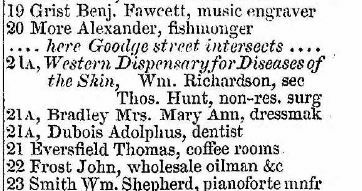 On 8 July 1855, Reynolds’s Newspaper mentions the annual meeting of the Western Dispensary for Diseases of the Skin, which was held on the 26th of June “at the dispensary, 21, Charlotte Street”. The Post Office Directory entry for 21 Charlotte Street explains this seeming discrepancy. They have three occupants at number 21A Charlotte Street: the Western Dispensary, Mrs Bradley, dressmaker, and Adolphus Dubois, a dentist. For number 21 they have the coffee rooms of Thomas Eversfield. 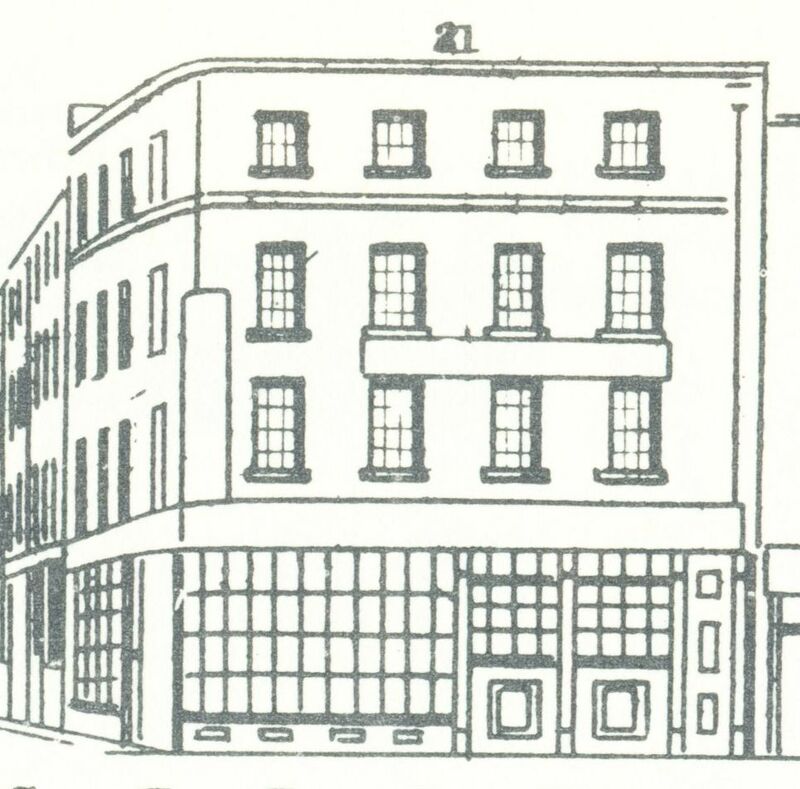 As they also indicate where the side streets are, we can work out that 21A is the building on the corner of Goodge Street and the coffee rooms must be further up Charlotte Street, the same premises as where we found surgeon Gibbs in the Tallis Street View. 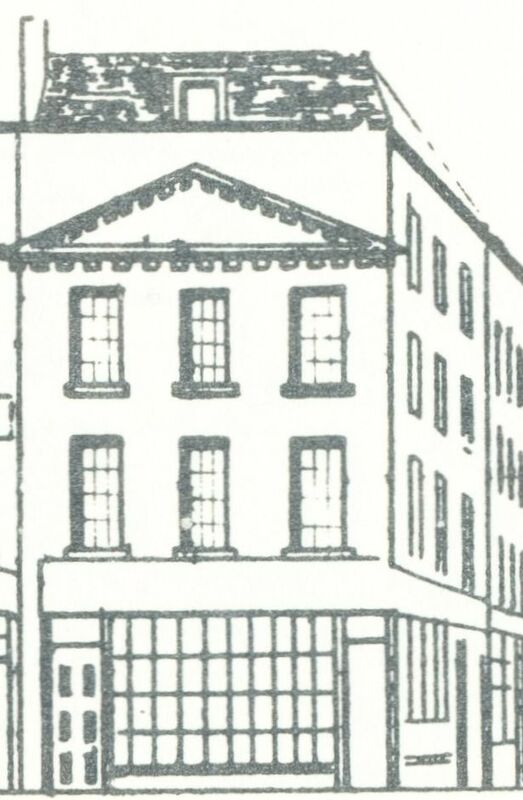 The 1871 census gives for 21 Goodge Street, “only a shop in which no one sleeps being part of house, corner of and numbered in Charlotte Street”. Charlotte Street had by then been renumbered from number 21 to number 44 with various families listed, among them one James Titley, a chemist. Did he take over from Anderson? Titley acquired some notoriety in 1880 for supplying drugs to induce an abortion, and I will leave you and this post with the newspaper report of the Old Bailey case. Reynold’s Newspaper, 19 December 1880. Click to read the whole article. (1) The London Gazette, 15 February 1814 and 6 October 1835. (2) The London Gazette, 25 December 1846. (3) England & Wales, National Probate Calendar (Index of Wills and Administrations), 1862. Effects valued at under £450. (4) The London Gazette, 6 December 1844. (5) The London Gazette, 16 November 1847. (6) The Directory & Chronicle for China, Japan etc., 1865. (7) The London and China Telegraph, 27 February 1866. (8) England & Wales, National Probate Calendar (Index of Wills and Administrations), 1866. Effects for Thomas How valued at under £60,000, but resworn in 1868 at under £30,000. (9) The Daily News, 29 May 1867. Although Tallis in his index spells the name of Augustus Union Thiselton as Thistleton, I have chosen to use Thiselton as that is the spelling the family of printers preferred. It all started with William Thiselton who established a printing house and bookshop in Goodge Street at least as early as 1784, but possibly even earlier. To whom William Thiselton was apprenticed is unclear as his name does not appear in the list of Stationers’ apprentices, nor in the freedom records of the City of London, which suggests he never felt the need to apply for the freedom, his business being outside the City boundaries. His sons, however, were apprenticed to a master who did hold the freedom of the City and were as such listed in the records. More on them in a moment, but first William’s career. One of the first publications that lists his name is The New Spectator, a short-lived weekly magazine that appeared from 1784 to early 1786. 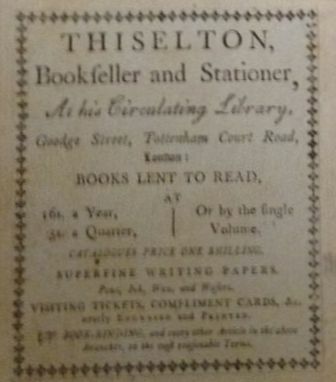 Thiselton’s was one of the booksellers where the publication could be bought. The publication already had the 37 Goodge Street address, so he certainly traded from that address as early as 1784. 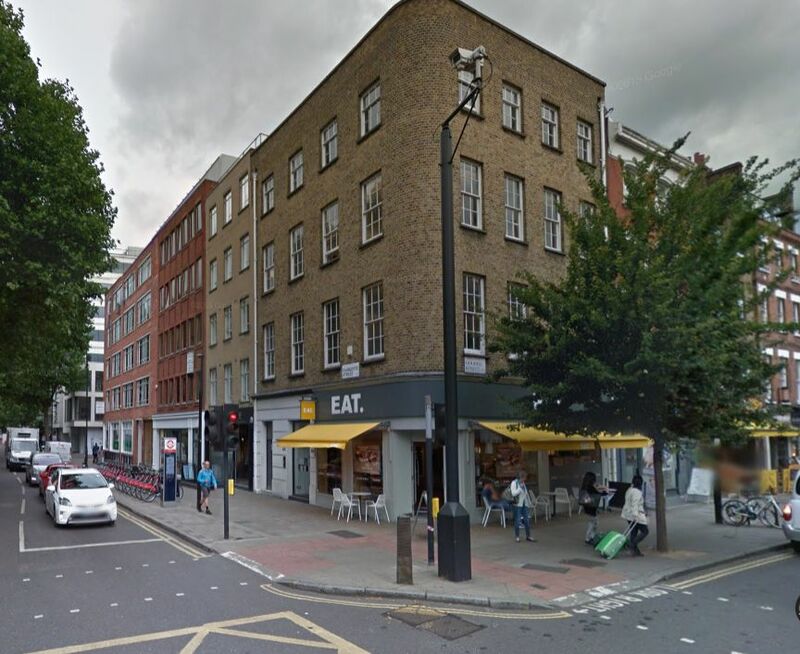 Number 37 was situated on the south side of Goodge Street, on the corner with Charlotte Street. 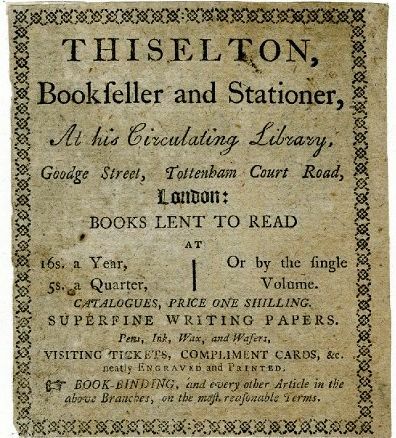 At some point Thiselton extended his book selling activities to include a Circulating Library, a popular 18th-century way of making literature available to those who could not afford to buy the books outright. Although we know nothing about the titles on offer in Thiselton’s library, the collection probably consisted mainly of multi-volume novels and other popular reading material. More on circulating libraries here. The trade card shown above is from the Ambrose Heal collection of the British Museum, but another one has turned up recently in a 4-volume set of Richard Cumberland’s Henry (1795), for sale at Doull Books (see here). This one has the same text as the other one, but the decorative border is slightly different and small differences in the position of the words show that the cards must have been printed at different times. Thiselton was involved with the Masons and his name appears in the membership list for the Tyrian Lodge with an admission date of 8 January 1784. 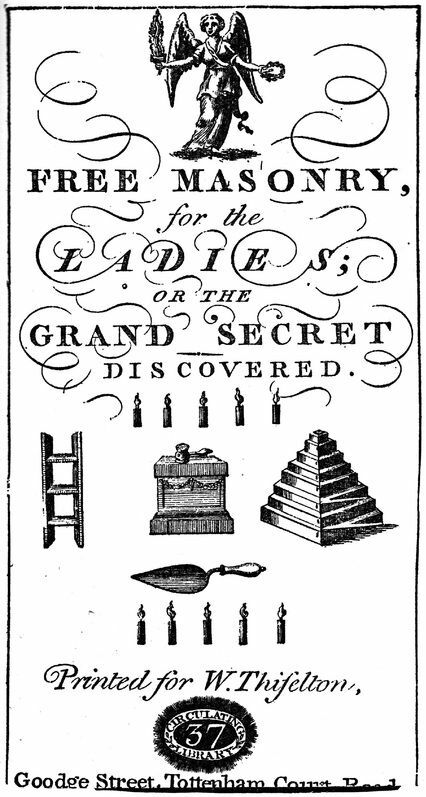 He printed several masonic texts, such as Free Masonry for the Ladies (1791), shown here and also Free-Masonry. A Word to the Wise! 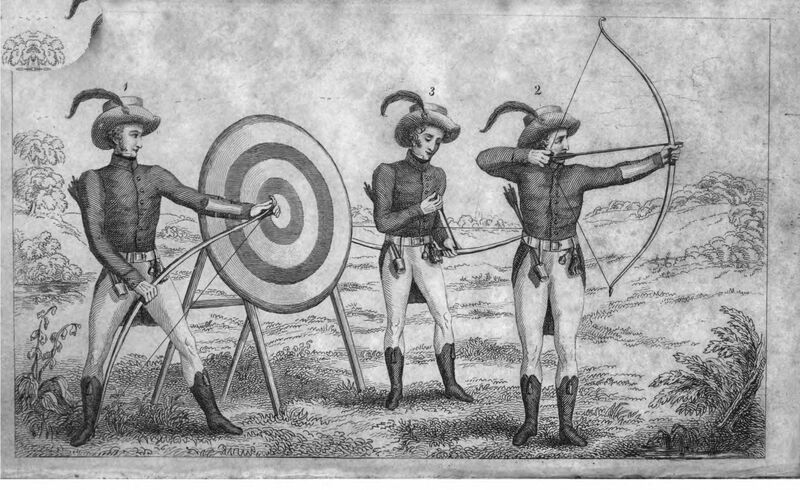 (1796) (online here). The last mention of the Circulating Library is in 1806, when W.H. Rayner’s Virtue and Vice was published “for the author, and sold by W. Thiselton, Circulating Library, 37 Goodge Street. The colophon shows that the actual printing was done by William Matthew Thiselton, William’s eldest son. In the mean time, William Matthew also changed his vocation. Desirous of becoming a magistrate, he qualified at the age of fifty as a barrister at Gray’s Inn and changed his name to W.M. 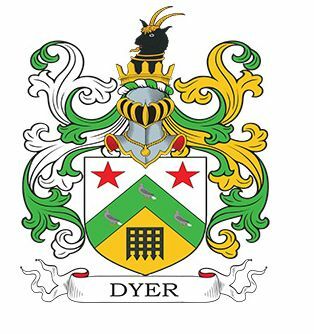 Thiselton Dyer, taking on the surname and coat of arms of his uncle Thomas Dyer (granted by the Queen on 16 April 1840). (10) He died in May 1842 and the Freemason’s Quarterly listed his public offices: coroner and steward for the Tower of London, magistrate of Middlesex, Westminster, and the Tower Royalties, governor of the hospitals of Bethlehem, Bridewell and St. Bart’s, and he also held an unspecified “responsible situation” in the stamp and tax department at Somerset House. The journal also mentions his physique as strong and six feet four in height. He was able to pull 400 an hour at a press, but a few months before he died he had been “reduced to a mere skeleton” through “marasma, or atrophy”. (2) He is variously described as an artist or as a scene painter in the masonic membership records. He died in 1842. (4) Freeman’s Journal and Daily Commercial Advertiser, 2 October 1832. 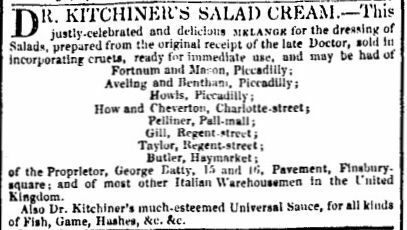 (5) The London Gazette, 17 April 1840. (6) Freemason’s Magazine and Masonic Mirror, 1 October 1870. (7) From 1828 (The Morning Post, 11 January 1828) till at least 1837 (The Morning Post, 20 May 1837). (8) The Standard, 21 June 1869. (9) The Metropolitan Charities: Being an Account of the Charitable, Benevolent, and Religious Societies … in London, 1844. (10) England & Wales, National Probate Calendar (Index of Wills and Administrations), 1869. Estate valued at under £600. (11) England & Wales, National Probate Calendar (Index of Wills and Administrations), 1875. Estate valued at under £200. (12) England & Wales, National Probate Calendar (Index of Wills and Administrations), 1873. Estate valued at under £30,000. He was living in York at the time of his decease. 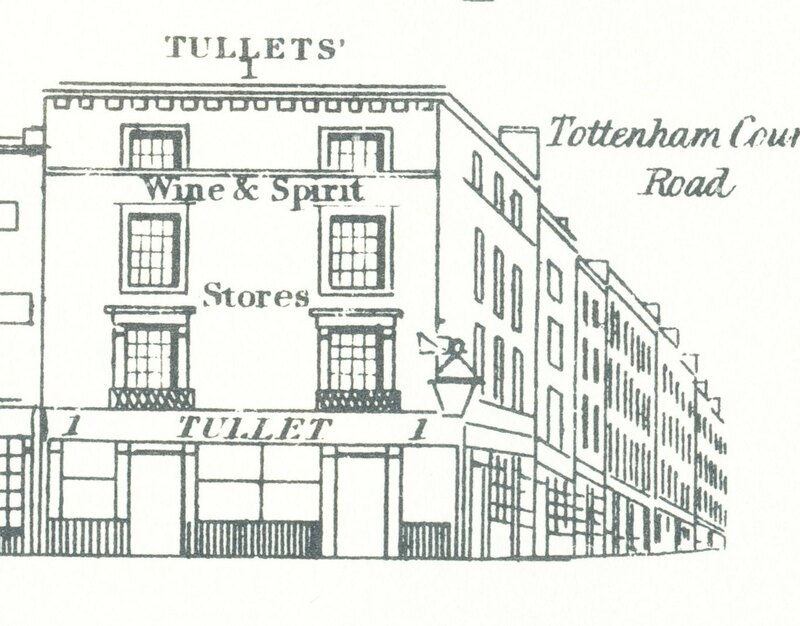 In his introduction to booklet 54 (the Goodge Street one) Tallis writes: “at the corner of the street, and its junction with Tottenham Court-road, is Tullet’s Wine Vaults, which forms our vignette. This splendid establishment is one of the most respectable and quiet in the metropolis, with wines and spirits of a superior order”. 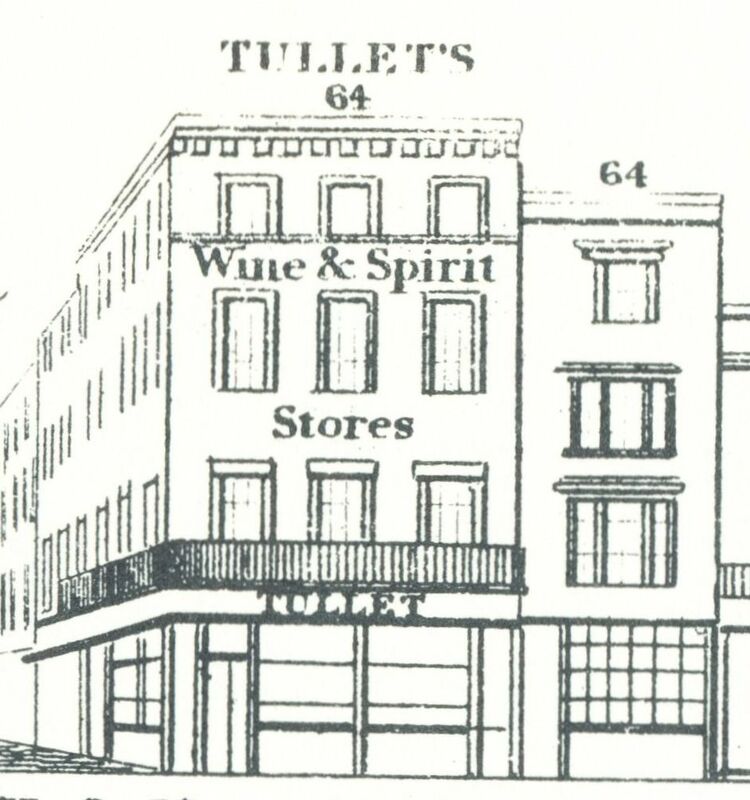 Tallis also says that Goodge Street was built in 1763 and the vignette shows that the wine & spirits establishment was founded a few years later, in 1769. The proprietor at the time of the Tallis publication was John Thomas Tullet who refers on the building to the ‘late Sowerby’. We might imagine that Tullet took over when Sowerby died, but then we would be wrong. 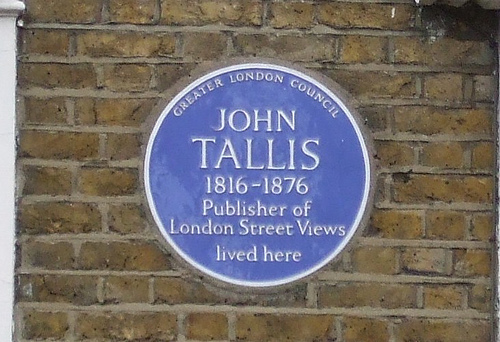 Tullet inserted an advertisement in the Tallis booklet in which he mentions “his predecessors, the late Mr John Read, as also his father-in-law, Mr John Sowerby”. John Richard Reid (not Read) had married Sowerby’s daughter Isabella in 1831 and is described in the 1832 Sun Fire Office record as the victualler of The Coachmakers Arms, Bentinck Street, Marylebone. On 15 June 1836 he is given as the one who takes out insurance for the property on the corner of Tottenham Court Road and Goodge Street. It was, unfortunately, one of the last things he would do, as on 4 August of that year he is buried at St. Marylebone’s, just 29 years old. In his will he refers to the property as the Talbot Arms, although in other sources it is usually referred to as simply ‘the Talbot’. John Thomas Tullet took over from Reid, probably straight after the latter’s death, as in 1837, in an Old Bailey case, he says that is living at the Goodge Street property, “I occupy the house myself, it is a public house”(1). So, although the name of Sowerby is painted on the wall of the public house, he was not the immediate predecessor of Tullet. Perhaps the name of Sowerby was better known than Sowerby’s son-in-law Reid and ‘late Sowerby’ became more a quality announcement than a chronological reality. Fact is, that when John Sowerby wrote his will in June 1837 (proved after his death in August 1839), he described himself as of 10 Kent Terrace, Regents Park, but late of Goodge Street, Tottenham Court Road. He was certainly the proprietor of the Talbot from 1817 to 1831 when his name, albeit sometimes spelled Southerby, appears in the Land Tax records for St. Pancras. Although Hinton does not actually say that Haythorn is the publican and I have not found any corroborating evidence, it is likely. Why else would he mention the name in the same sentence as the name of the pub itself? And another witness, George Hamp, said that the accused “crossed Goodge-street: at Haythorn’s corner”. Also no actual evidence, but who else would you name the corner after than the person having the establishment on that particular corner? 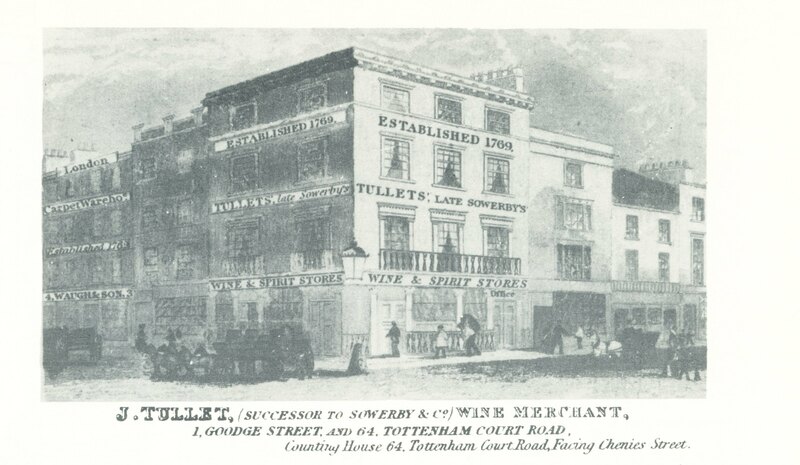 In 1825, John Sowerby of the Talbot was one of the subscribers to the Licensed Victuallers’ School and so was John Tullet who is at that time listed as of the Coachmakers Arms, Robert Street, Blackfriars Road. 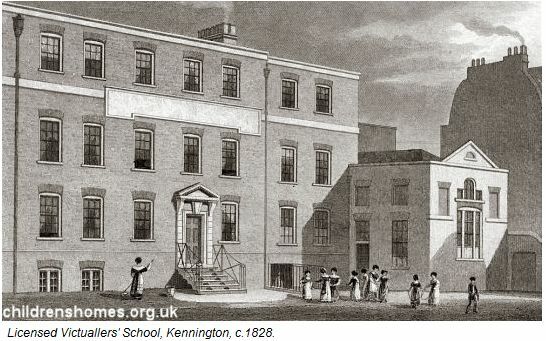 (3) The school in Kennington Lane, Lambeth, was founded in 1803 to provide schooling for the children of those working in the pub trade and still exists, although no longer just for those with a parent working as a victualler. (4) In 1829, John Tullet took out an insurance for the Duke of Grafton, Palace Row, New Road (now incorporated into Euston Road) and that same year he married Fanny Bristed. (5) The couple had three children: Fanny Adelaide (1830-1831), Emily (1832-after 1884) and Fanny Clara (1835-1864). When Fanny Clara was baptised, the address given was still Palace Row, so it is likely that Tulley moved straight from the Duke of Grafton to the Talbot. (1) Old Bailey case t18371023-2341. (2) Old Bailey case t17821016-5. (3) Address to the Ladies and Gentlemen, Subscribers to the Licensed Victuallers’ School, in Kennington-Lane, Lambeth (1825). See for more on the school here and here. (4) See the school’s website here. (5) St. Pancras Church, 17 June 1829. (6) St. Pancras Church, 20 September and 25 October 1855. (7) England & Wales, National Probate Calendar (Index of Wills and Administrations), 1871. Address given: 260 Camden Road, estate valued at under £2,000. (8) England & Wales, National Probate Calendar (Index of Wills and Administrations), 1884. Address given: 260 Camden Road, estate valued at a little over £3,397. (9) English Heritage Building ID: 489616.